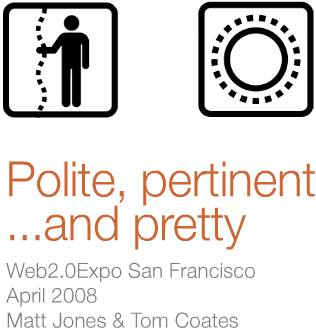 “Polite, pertinent and… pretty: designing for the new wave of personal informatics” was the title of a talk given by Matt Jones (Dopplr) and Tom Coates (Yahoo! Brickhouse) at the recent Web 2.0 Expo in San Francisco. Summarising their talk is not an easy thing to do, but I will give it a try. In any case the 81 slides with speaker notes are available on SlideShare. But what does that mean concretely? How should we design? Jones and Coates propose “three pegs to hang some thoughts off” and they all start with a P.
In defining the concept of politeness (to be thought of as the “softer ying to the hard yang of ‘privacy’), they lean on such thinkers as Adam Greenfield (and in particular his recent book “Everyware“), Mimi Ito, Leisa Reichelt, Matthew Chalmers, Anne Galloway and of course their own practice. Pertinence is about “disclosing information that is timely and as ‘in context’ as possible”. To define this better, they refer to the ‘movement’ metaphor that Matt Webb of Schulze & Webb recently described in a talk. Webb posits that we are moving from a web of ‘places’ to “something more like a web of organisms or engines connecting and fuelling each other”. So the issue here is to show small pieces of information in the right context at the right time, “delivered in increasingly pertinent ways, depending on our habits and contexts”. “The vast quantities of information that personal informatics generate need not only to be clear and understandable to create legibility and literacy in this new world, but I’d argue in this first wave also seductive, in order to encourage play, trial and adoption”. So what is the future of personal informatics? Aren’t we creating our own “participatory panopticon” (Jamais Cascio)? Or are we moving to a world filled with “spimes” (Bruce Sterling)? At the moment it’s often artists who are exploring the boundaries of this unknown future. Steffen keeps on surprising me by the depth of his thinking.